I dropped off a few towels yesterday to guests from New York who were visiting south Cocoa Beach for the first time. I asked how their stay had been. They said that when they walked out onto the beach the first morning they were concerned that no one else was there. Was something going on they should know about? By the second morning they realized that very few people on the beach was a normal thing in south Cocoa Beach. Their second comment was that the people in Cocoa Beach were, as a group, the friendliest they had ever encountered in Florida. I'm thinking we'll see them again. Sales in Cocoa Beach and Cape Canaveral continue at a brisk pace. The 11 year record breaking number of sales in May and June despite record low inventory is evidence of the extraordinary demand for residential properties that we are enjoying. I see no evidence that this has changed. So far 34 units have closed and another 39 have gone under contract since the month began. There are only 237 condos and townhomes for sale at the moment in our two cities and another 25 in planned buildings. We closed more than a third of that existing unit number last month alone. Of the condo and townhome sales closed so far in July the average selling price was 95% of the last asking price. That "last asking price"qualifier is important. Of the 35% of sales that were on the market less than a month, none had a price drop before accepting a contract. That means they were priced right when listed. Of those who started high and later reduced their asking price, average time on market was 83 days. Sellers take note. It seems everyone in town is walking around with bulging grocery bags. 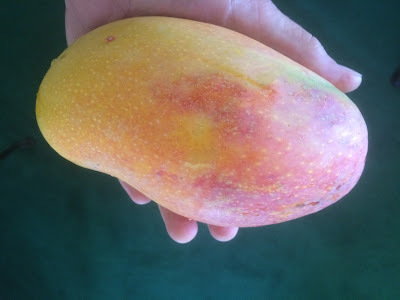 In most cases they are filled with mangoes like the one pictured. This is one of those years when every mango tree is loaded down and the harvest is so excessive that those with trees are giving mangoes to everyone they know. The locals are forced to eat excessive amounts of mangoes every day or live with the guilt that they are going to waste. We can only make so much salsa and chutney and freezer space eventually runs out. It's a tough problem but we'll see it through. By the way, that mango pictured is as tasty as it is pretty. Juicy, not stringy and as sweet as ice cream. We are squarely in the daily afternoon thunderstorm season with dark fronts like the one pictured a fairly common occurrence. Independence Day fireworks are no match for the fireworks that usually accompany these afternoon storms. The first half of 2016 ended on a strong note with a record month of property sales in Cocoa Beach and Cape Canaveral. June 2016 was the second busiest month for closed condo and townhouse units since the peak of the boom in 2005 with 77 units recorded as closed so far in the Cocoa Beach MLS. As always, that number could increase as tardy listing agents get around to closing out their sold listings. For perspective, that is 29% of the entire inventory sold in one month. In addition, during the month there were 14 closed single family homes and a single half duplex. A third of the homes sold for more than a half million dollars with two river houses closing above the million dollar mark. Condo sales were concentrated in the lower price ranges with two thirds of the 77 sales under $250,000. Only three units sold for a half million or more, the highest, one of the three big 4/4 Magnolia Bay units that closed for $565,000. Mortgage use for condo purchases continues to increase with just under half of the condo buyers in June using a mortgage for the purchase. There were 81 closed single family homes and half duplexes from January 1 through the end of June. There are 55 currently for sale. Buyers who want a single family home on the water in Cocoa Beach have 31 to consider at prices from $2.95 MM for a brand new direct ocean 2 story with 4667 square feet to a nicely remodeled 55 year old 3/2 canal home with 1520 square feet asking $399,500. Almost two thirds of them have been for sale for more than 100 days so we can assume some resistance to the asking prices considering the number of buyers actively looking to purchase. Likewise over half of the condo listings have been on the market over 100 days. Same assumption about pricing can be made for most of these. About "days on the market": This number can be manipulated by an ambitious listing agent so it can't always be trusted. Your buyer's agent can peek behind the curtain for the true listing history. A listing can be withdrawn and relisted to reset the days on market clock. Same thing can happen with an expiration and relisting. While we're on the subject of accuracy, I get lots of calls and emails from out-of-town buyers who have spotted a waterfront condo unit at a very attractive price on the MLS or one of the other big real estate websites. Those too-good-to-be-true prices are almost always misrepresented properties. While Villages of Seaport is technically an oceanfront community and a listing agent can code a listing there as "oceanfront" they never mention that the cute $115,000 two bedroom townhouse listed as "oceanfront" is actually a half mile from the beach. Likewise a smoking deal on an "oceanfront" Conquistador usually turns out to actually be in the non-waterfront Conquistador building on the west side of Ocean Beach Blvd. Turtle nesting activity in south Cocoa Beach has been strong with a short walk on the beach most any morning revealing several new nests.